Heritage Harbor is a par-72, 6,900-yard course with four sets of tees and loads of water and marshes to cross. Along the way, you’re likely to spot hawks, ospreys, loons, ibis, herons and kingfishers; you name it. It’s a paradise for birds as well as for golfers. The intention here was to create a playable public course, but also one that can get golfers to think and rise to new levels of play on some holes. As you tee off at the start, you face a par-4 slight dogleg right that’s yards from the back tees. There’s a pond to your right fairly easy to avoid but the real obstacles to making par are the bunker just past the pond and the fact that you can’t be long on your approcah. The 13th hole is a favorite because of the forced carry over a natural wetlands area needed on your second shot in order to reach the green. This is a par-4, 415-yard hole from the tips, 284 yards from the forward tees. It’s typical of the type of rhythm you need to get into in order to play Heritage Harbor successfully. A good first shot to get into position to cross a band of marsh. But the par-3 14th hole is probably the one that amazes most players – in terms of the golfing skills that it demands. From the back tees, it’s 263 yards across a natural area that’s 100 yards wide and over a pond as well. In all, from the championship tees, it takes a 225-yard tee shot, probably with a driver, just to carry onto dry land in front of the green. Then you still have to cross a bunker to get to the putting surface. It’s the most memorable hole on the course, and has been conquered. But not often…. From the other sets of tees, this shot is less demanding – 131, 118 and 104 yards. But the back tees are there if you feel like getting out your big guns and maybe straining your back. The 18th is a scenic par 4 hole where you can use a driver from the back tees (378 yards) and then hopefully get close enough to a natural area that has to be carried in order to reach the elevated green in two. Watch out for the wooded area behind the green. To get to the green, you ride your cart over marsh on one of the course’s many picturesque winding wooden bridges that carry you over the wet spots. On the front nine, two popular holes are the par-4 4th hole, a dogleg left that’s 422 yards from the back tees, and the 7th, a challenging par 3 (213 yards from the tips, 125 from the forward tees) where the green is heavily protected by sand. One of designer Jed Azinger’s favorite holes at Heritage Harbor is the risk-reward, par-5 8th that first takes you on a dogleg right and then on a dogleg left. From the tees and farther down the fairway you have to cross natural wetlands. This hole plays 557 yards from the back tees and 386 from the forward tees. 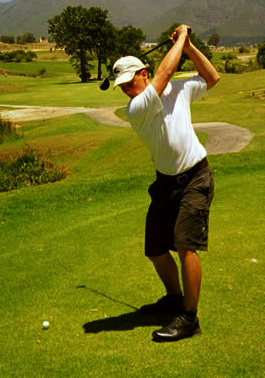 You need to hit a good distance shot off the tee, but subsequent shots demand precision. If you hit your drive far enough, you might be tempted to try to reach the green in two, but most people will have to lay up to cross the natural area because of the narrow. Most players find they need three good golf shots here in order to reach the green for a chance at making par on No. 8. Along the way throughout the course, you’re going to face some challenges from the bunkers. The green at the par 4 9th hole (373 from the back tees, 263 from the forward) is an excellent example of that. 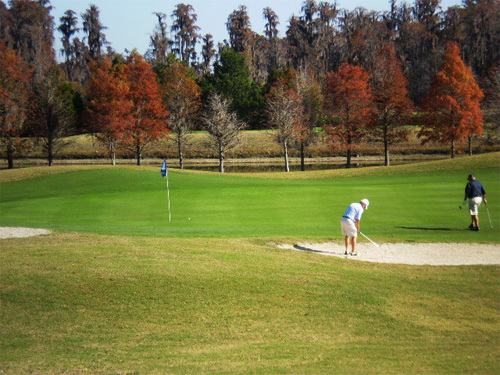 And if you manage to negotiate the sand successfully, you still have to avoid hitting too far and running into trouble with the trees that line the back of the green. What you won’t find on this tract are houses crowding the fairways. There are only five holes out of 18 with housing on both sides. That’s unusual in Florida, but because of the wetlands here and the way the course was designed, many of these areas will have no building on them at all. From the gold tees, Heritage Harbor is 6,898 yards long (rating/slope, 73.5/129); from the blue tees, the course is 6,053 yards long (rating/slope, 69.4/117); from the white tees, the course is 5,437 yards in length (66.9/109); from the red tees the distance is 4,773 yards (68.2/116).